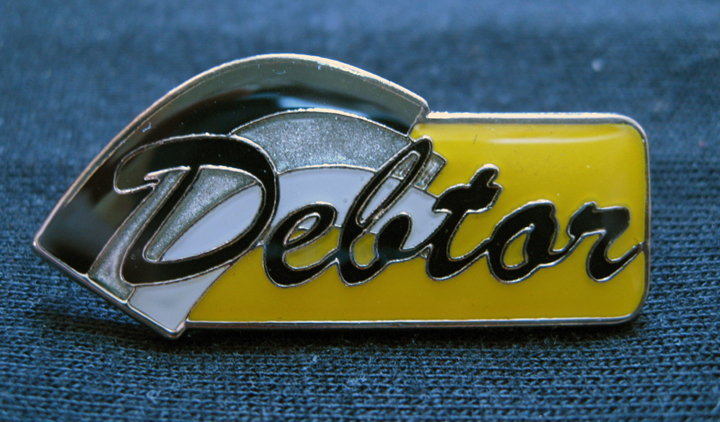 I have, almost gleefully, gone into more credit card debt, myself, in order to get more “Debtor” pins made [by a business in Florida, manufactured by factory workers in China, shipped to NYC]. These pins will, in the instance of this show, be given away for free. But you have to show up to experience the rest of the show in order to get one. I’m really looking forward to meeting the other artists working through this quagmire. In the last year, I’ve been most compelled by Fred Moten and Stefano Harney’s chapter on “Debt & Study” in their book The Undercommons: Fugitive Planning and Black Study. They have, awesomely and almost unbelievably, made their whole book available for free, online, as a pdf. That’s what I’ve linked to, above. The whole thing is complex and amazing, requiring many moments of re-reading just to comprehend it, or comprehend it differently, the interview at the back is transcendant, and the chapter I’m speaking of is pg 61-68. Throughout the book, the way they frame social debt as positive debt, the kind that is unrepayable and borne by us all, the kind that keeps each of us afloat – debt as the social fabric of kindness and favors done with the expectation only of its acknowledgment, never as a thing to be paid back – and especially this kind of living as a way (and sometimes the only way) of surviving in a world where you and your people might have very little or very inconsistent access to capital in all its forms – has profoundly affected me. There’s so much else to recommend this book – please do yourself a favor and read it. And let me know what you think! If you’re in NYC, stop by the gallery at Flux Factory between June 3-24 (open Weds-Sat, 12-6) – schedule of events for the duration is here. My sincere thanks to Caitlin Foley and Misha Rabinowitz for inviting me to be a part of their show. Honored and gladdened, and can’t wait to be there! Thanks again to the Women’s Center for Creative Work for inviting me to their pop-up residency at the LA Art Book Fair in February! This was the first time I’d gotten to play “nurse” with this project. 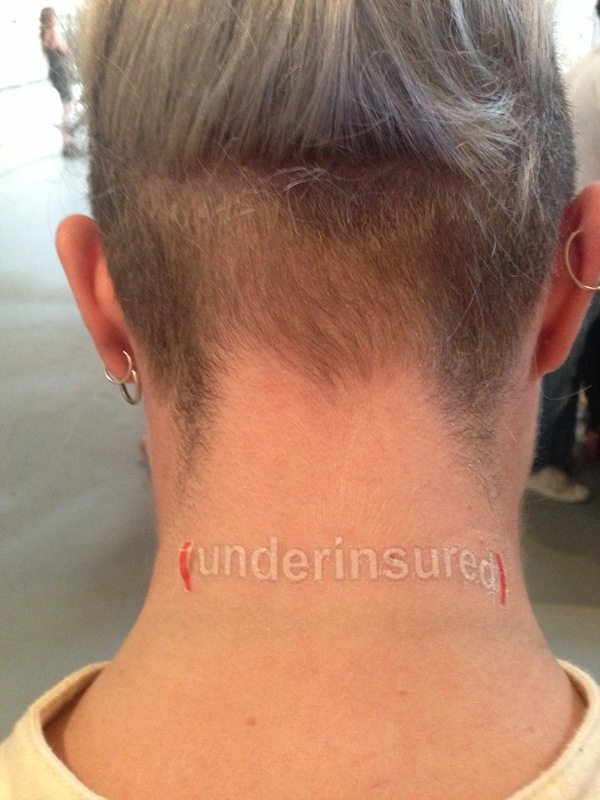 Actually applying the (underinsured) and (uninsured) tattoos to people’s bodies – people who very much wanted to name their precarity publically, at a time when “everyone” is supposed to be insured – felt like a symbolic manifestation of nursing inside a broken system. My actions were obviously merely palliative, applying band-aids to breaks, but the moments of connection and discussion with strangers were funny, poignant, and sometimes, strangely, mutually triumphant. People talked to me and to each other, to whoever was around, to whoever would listen, about not having health insurance, about going broke or staying hurt because of high deductibles. 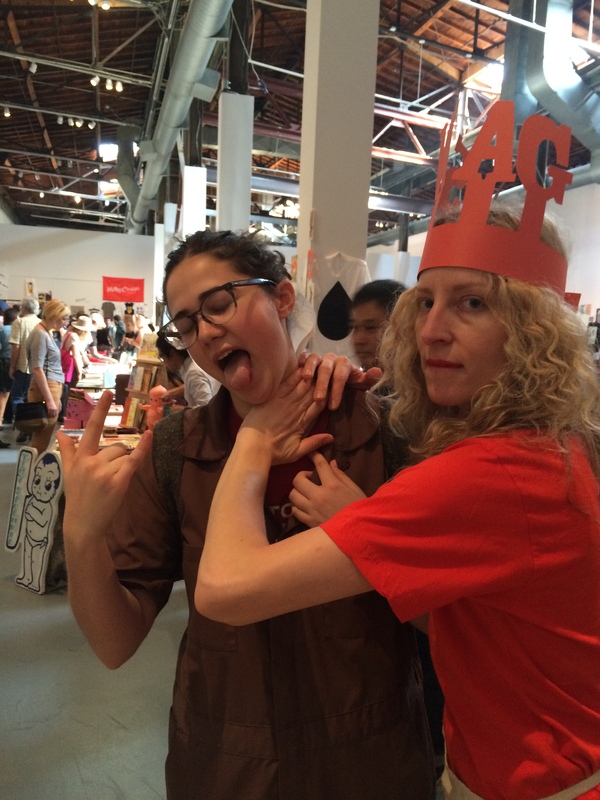 SWAG goes LIVE at the LA Art Book Fair, February 11-14! It’s clearly been awhile since I’ve updated this site – who goes to individual project websites anymore? – but for the sake of historical thoroughness/site specificity, I will say here and now that I’m pleased to be activating SWAG sales this coming Saturday, February 13, 2016, from 1-4pm, at Printed Matter’s Los Angeles Art Book Fair at the Geffen Contemporary! 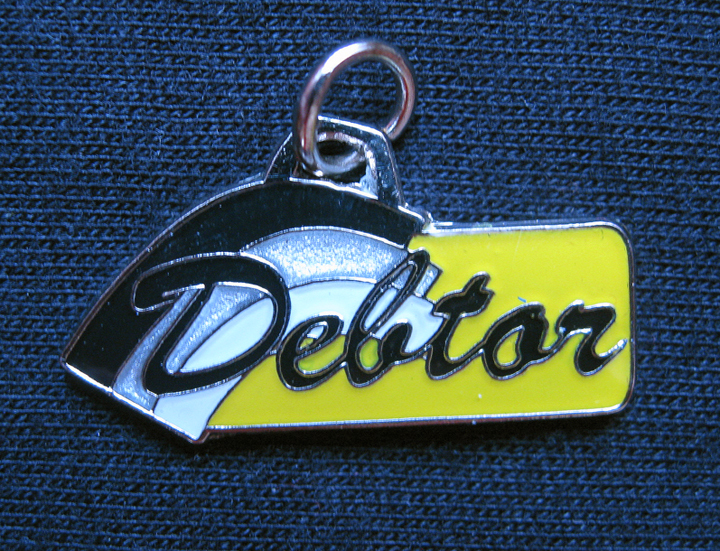 Several items in the SWAG for Hard Times collection will be sold at the WCCW table for the duration of the LAABF (or until they sell out), so if you’re running low on Debtor pins and Debtor charm necklaces, you know where to get ’em. Can’t wait for the crush of human art book nerdery and the discussions we’ll start/continue! Fascinating article on recent research regarding the neurobiological effects of financial stress – long-term implications included. If you’re in or near Madison, WI, in the next week, please feel free to stop by the “Unstable Systems” show on campus at the Arts Lofts Gallery, 111 North Frances Street, 53703. Gallery hours are 9-5 with an opening reception April 14, 5-7PM. 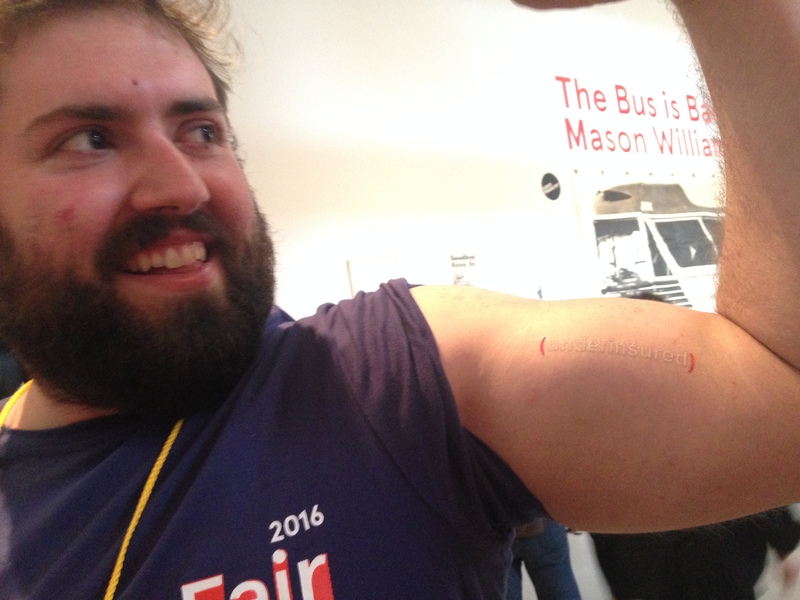 I wish I could be there – the thematic focus sounds like precisely the kind of show I want to see – but, in lieu of my actual presence, there will be a FREE SWAG temporary-tattoo application station. Stop by and emblazon yourself if the insurance industry is still failing to do right by you! And here’s a link to the event on Facebook. Thanks to the Unstable Systems Team for including me in this show!! It’s an honor. 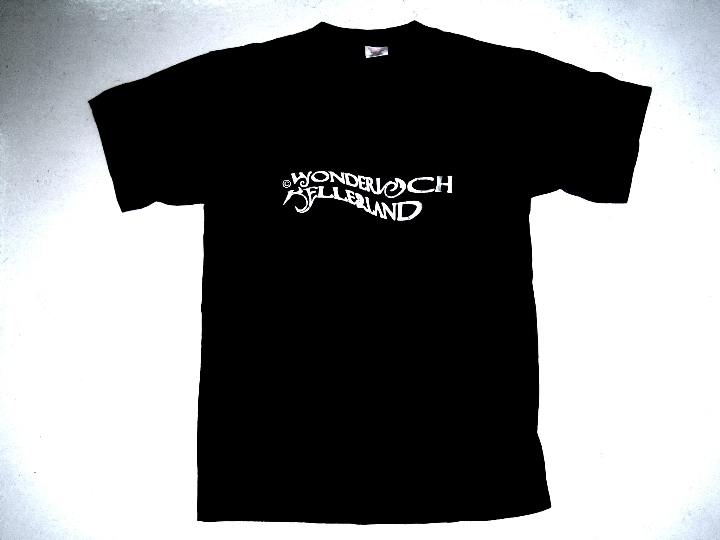 Wonderloch Kellerland Gallery (Los Angeles and Berlin) is hosting an “Artists Merchandising Art” show in its galleries this month. SWAG will be available – in its “honor-system store” format – at the Los Angeles location from Feb 11 through the 26th. Stop by the opening! 3149 Glendale Blvd., Los Angeles, CA, 90039. ARTISTS MERCHANDISING ART is the first series of international exhibitions to deal with the issue of merchandising in contemporary art and its relevance for artists, art and the art market. The exhibitions open simultaneously in Berlin and Los Angeles and will later travel to Vienna, Paris and Hamburg. Primarily used for sales promotion, merchandising has now become an integral part of commercial distribution and the creation of an image. The fundamental difference between a merchandising and an original brand product, is the merchandising products’ absence of actual user value while at the same time a logo or the image is still delivered. We know Caravaggio-mousepads and Andy Warhol-lighters, but is there merchandising in contemporary art outside of the museum shop? Are the well known artist-editions of art magazines or art institutions merchandising, in the way that they are a comparably cheap way to get your hands on a certain image? Does the “publishing company” shop OTHER CRITERIA, which was founded in 2005, fit the category? Does it make sense to transfer the category into the realm of Fine Arts? Could a transferral enrich the discourse? Or has it been part of the art context for a while and the borders have long been fluid? And if that was the case, would it mean that every piece of art is a merchandise article transporting the image of the brand product artist? Almost nothing bores me more than the idea of writing my own blog posts for this site – as is obvious from those that have come before (the writing within them, by and large, not exactly crackling with necessity): I’m more interested in others’ experiences with regard to this project, and the most important “site” for SWAG for Hard Times stuff is out of my hands, away from me, in your hands (and not even here, on the internets). But sometimes, something happens with this project that seems worth writing about. De-installation of the UCLA show last week provided just such an experience. I knew this moment would come: the emptying of the “bank” built into the honor-system pedestal. How much money would be there? 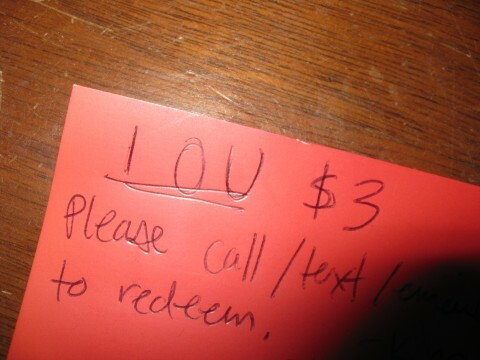 Would other things have been inserted into the slot as payment? What would I find? How would that bank-dump serve as a record of the project’s reception in that show, an indication of people’s reactions to and (future) use of SWAG? My good friend Kari tilted the pedestal for me, and as I scooted beneath the box, a zippered black leather pouch in hand to catch (and, thereafter, hide) the takings, I felt as though I was stealing from my own project. Very strange. Like what I was doing was not allowed even for me. Maybe it’s the leather “heist” pouch, or maybe it’s that I never have the opportunity to upend a piggy bank full of my own earnings, anymore (living on federal student loans, receiving that check every 5 months, just isn’t the same as counting money you’ve made from working). I do keep the prices for this stuff as non-capitalizing as possible, attempting to just cover my costs (which, to date, has never happened). So why did I feel like I was stealing? 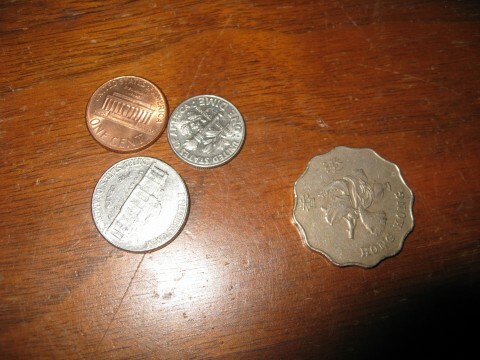 Spare change - no real correlation with the prices of SWAG - and a $2 coin from Hong Kong! I’ve “performed” this project as a salesperson many times, and the risks of doing so are the usual embarrassments of showing up in costume, sometimes uninvited, to sell small things to people who are likely to be disinterested. But I have not before taken the risk of “selling” based purely on the honor system. Would I get completely fleeced? 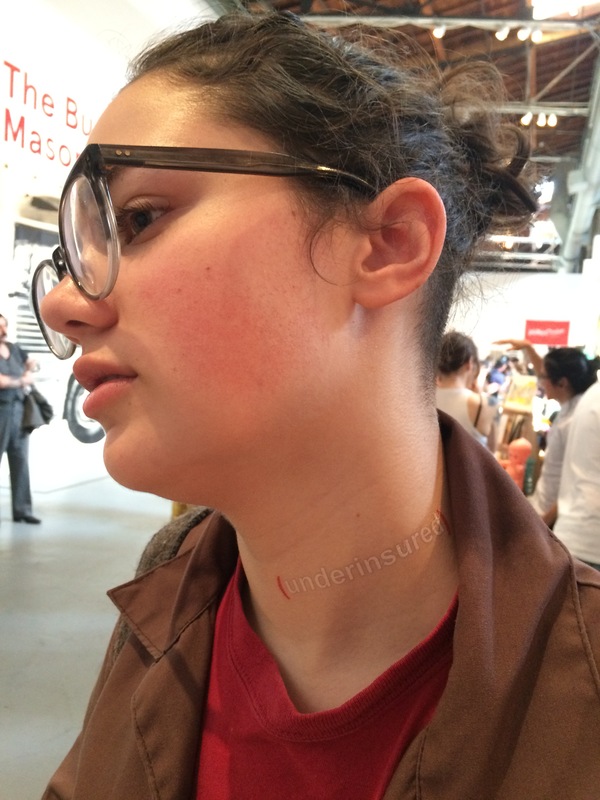 True, part of how we sited the project in the exhibition space revolved around how various sightlines would enable others to see you when you were at the SWAG pedestal: I’m interested in how potential surveillance alters our behavior. Clearly, that’s part of my interest in creating wearable political statements for “you,” in the first place – how will it be for you once you wear it in public, in view of others and their unpredictable reactions? But regardless of social mores against stealing, it turns out I did, quite likely, lose some money in this installation of the project – I may have miscalculated my initial inventory, or I may, indeed, have “earned” double what was left in the bank box, based on how much SWAG seems to have been taken. But I’ve been thinking about the outcome this way: if some people took SWAG without paying for it, because they valued it, then that, too, is a form of exchange, and it’s a form I can even support, philosophically-speaking. I guess it means I unwittingly gave those people a gift, and they accepted it. 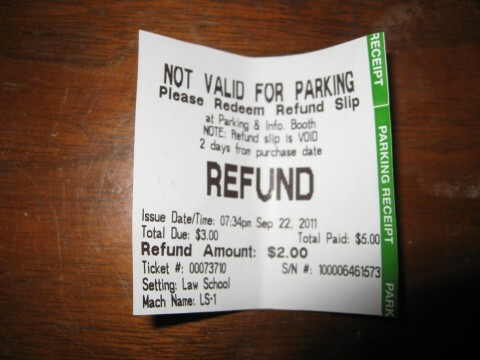 What goes around comes around…. Operating any monetary exchange based on “honor” probably reads as saccharine idealism to many people; that it worked at all still surprises me. 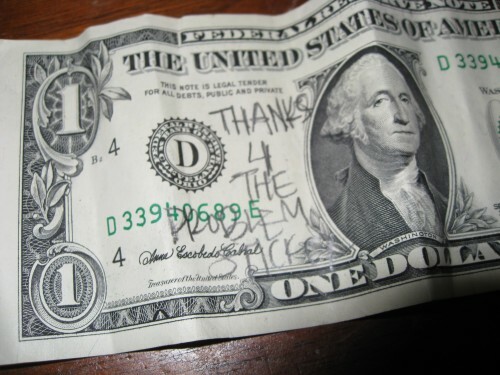 To each of you who folded a dollar or two to support the project, thank you. Your honesty redoubles your investment. As always, report back about how you used your SWAG – and what happened then…. 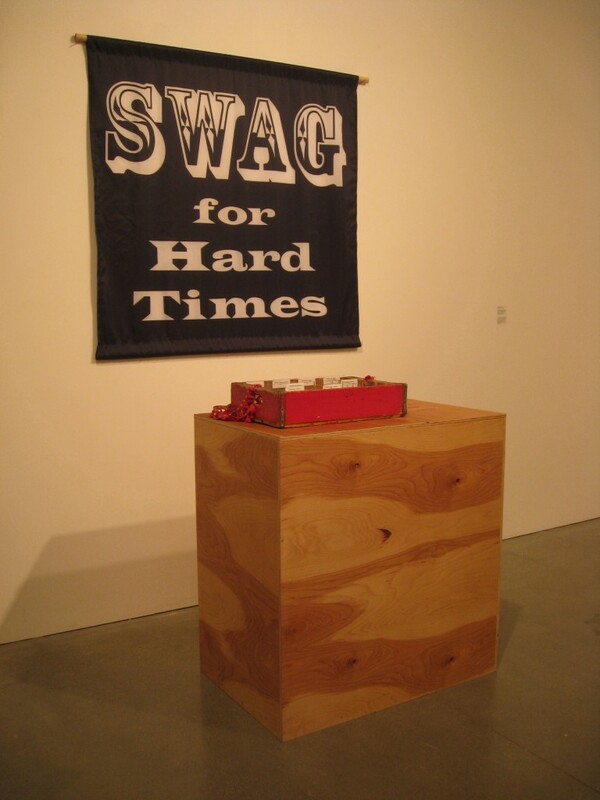 “SWAG for Hard Times” has been included in the show “Circulate, Exchange: Nugget & Gravy” at the New Wight Gallery at UCLA, Sept 22 – Oct 6. De-install is actually tomorrow, but I look forward to a group crit with all the artists from the show in the near future. It was a really strong show, from all reports (even unbiased ones), and I look forward to getting to know these other artists better. Thanks to Mathiew and Christine for including me among them. Getting a chance to install this project as an honor-system store in a public gallery setting was something I’d been hoping to make happen for a long time, and really liking the other work in the show is a huge bonus. 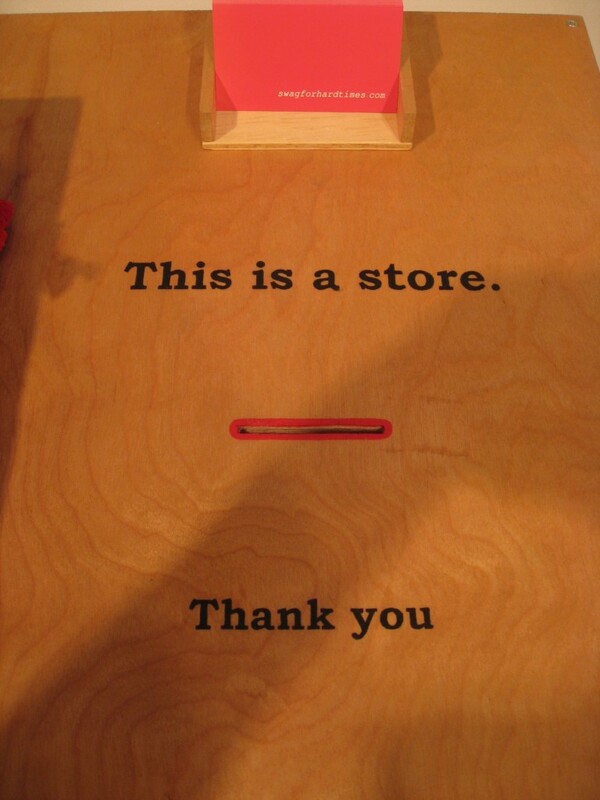 The mechanism for the honor-system "store"
For more on the show, visit the Circulate, Exchange website .